I’ve worked with Navajo jeweler Edison Cummings for over a decade, and I grow more and more fond of his jewelry as time goes by. 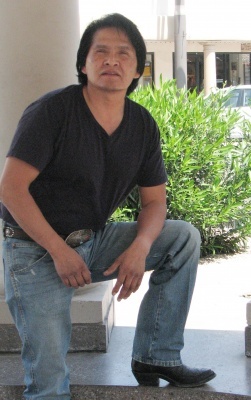 Born in the early 1960’s, Navajo artist Edison Cummings initially trained as a painter. By the time he studied metalsmithing, Edison was well-equipped to apply his painterly techniques towards jewelry making. Edison’s original jewelry designs combine materials and textures much like a painter would blend colors to compose a picture. The result is a visually stimulating piece of wearable artwork. Edison’s expert techniques never cease to amaze me. Often, artists will excel in one method like casting and shy away from others. Not so with Edison Cummings. He uses a great variety of processes. From repousse to chiseling to inlaying, stamping, and tufa casting, Edison Cummings executes them all beautifully. Compare Edison Cummings' silver agate bracelet to his tufa cast beaded bracelet, and you can see what a wide range of jewelry Edison Cummings creates, all absolutely original in composition varying in style from the more traditional to the very modern. Besides jewelry and painting, Edison Cummings has also ingeniously crafted silver in other incredible forms including flatware, teapots, coffee pots, purses, and boxes. 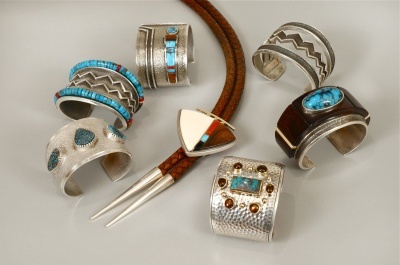 In fact, Edison’s diversity of finished pieces is greater than almost any other contemporary American Indian jeweler. To look at our presentation of Edison’s jewelry, one might not even realize that it is all from the same artist. Edison Cummings has won quite a few awards including the coveted Best of Class at both SWAIA’s Indian Market as well as the Heard Museum's Indian Fair and Market. Even with these accolades, I believe that Edison Cummings’ work is underappreciated and only stands to gain further recognition in the coming years.